Why does he keep saying “we”? Cool method. Takes forever though, it’s like a day job to run a quick PCB with all the preparations! Eh, I still think it’d be cool to have a plotter style design drawing tool. Just use a good sharpie marker for the pen, I know from at least one case that sharpies work really well as long as you don’t leave the board in the acid tool long. Nice job! Looks great for a very reasonable budget too. Hmm,i thought toner was toxic?? I may be able to help out with a laser printer.. would a brother hl 2040 do the job? @colin; of course “we” is a figure of speech here. 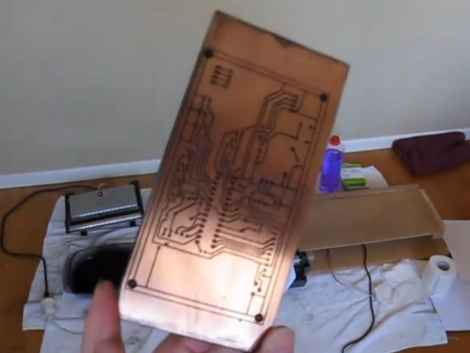 Rhys should at the beginning of the first video should say his inability to get Ferric Chloride etchant in ZL is the reason for this he employed this complicated method of making PCBs. Rhys’ blog points to a wep page with content by Adam Seychell, the same page inspired this instructacle http://www.instructables.com/id/Stop-using-Ferric-Chloride-etchant!–A-better-etc/ . I’m no chemist I suspect using all the information available it could be possible to create a Cupric Chloride etchant solution that is not so aggressive to need the etch resist method Rys has devised. IMO all this info should be archived by hackers, in the event Ferric Chloride for some reason becomes unavailable to the them. Just check out MG Chemicals. They have a nice pre-sensitized board that exposes with regular florescent lamps. You can do double sided, don’t need special lamps or LEDs or anything, just a regular drop lamp. Yes, this is a cool method he’s doing, but seems to be a lot of work, when MG Chemicals is so much easier. Minimum trace width with this method? To be honest I haven’t tested which I know is pretty lame. I will next time I do a board and put the results on the original post. The board on the post is 19mil from memory so not exactly impressive. I can do a complete 1 side pcb in less than 12 minutes ! cut transparency and adjust on pcb 1min. Be very careful with laser toner. The average particle size of its dust gets down to the micron level where it doesn’t matter if it’s Carbon or Arsenic, it’ll still cause you harm. People forget about how dangerous small particles can get. If you’re going to try something with laser toner, take some precautions beyond opening a window and using a mask as both probably won’t do much at that micron size. A humidifier, swamp cooler, low-micron HEPA filter or something else. Ionizers actually work well on toner dust but can take time to clear the air. @Rhys, I believe you completely missed the point of Tim’s question. Tim was simply pointing out the fact that there are better ways to DIY something like this, and I completely agree with him. I certainly wouldn’t try to use that dreadful toner dust without very good protection, and without an extremely good reason to do so. The best method is the one you use. I’m with rhys on this method, I have 3 epson r300s all sitting here, none of them need any adjustment at all to do what rhys is doing, they have a front feeding tray that prints to CD/DVD media. they come with an insert so that you can do business card sized boards, roughly 3.5″x2.5″x1/32″. If you hunt around there are methods for mixing your own conductive inks and printing the CIRCUIT directly to a blank substrate, I can’t see a laser doing that so easily. oh and 12mil trace / 10mil gap is easily achievable but if you hunt around on the sites that I have provided I believe they’re down to 3/3 which is pretty tidy in anyones eyes. Hey… after etching and cleaning, you could repeat the first steps of the process (printing/toner/baking) to print additional information on the component side, like component outlines, numbers, etc. Perhaps even yellow toner for this. Most toner material is just polyester resin dust and dyes, nothing particularly nasty at all. Only really a hazard as any dust is if you breath enough of it for long enough. Check the MSDS. oh good god, just buy the sheets of blue resist transfer sheets and call it done.. Why do you guys out there waste a week of tinkering to make a convoluted, rube goldberg process that ends up as costly as buying the blue transfer sheets? I don’t think doing toner directly via laser printer (aka “xerography”) will work.. bc xerography relies on a localized static charge to hold the toner in place before/while it gets fused to the paper as it rotates around the drum. 1st problem.. you can rotate copper around the drum.. and #2, copper would totally dissipate the static charge and toner wold not form patterns on the surface. Interesting, but I think I’d be more impressed with a laser-printer version that prints directly to the board, seals the toner, and you’re done. Just feed the board in one side, and it comes out the other (hot). But yeah, just use the transfer paper. surplustronics in auckland/nz had ferric chloride last time i was in there.